The runoff elections the other day had both good and bad results. On the good side, Francisco "Quico" Canseco, the two-time loser, won the Republican primary race to face Congressman Ciro Rodriguez in November. I wanted Canseco to win because I believe he was the weakest of the two runoff candidates. Will Hurd, a former Texas A&M student body president, seemed to have an enthusiastic support base that included the San Antonio Express-News which had endorsed him and written several glowing articles about him. Hurd had also been endorsed by his other primary rivals after the election, so having him fall short in the runoff was a lucky break. Now, perhaps, there may even be a slim chance that the Republican-endorsing E-N might even skip this race. More good news was the victory of the relatively moderate Republican Deborah Lehrman for a Supreme Court seat over right-wing Tea Party nutjob Rick Green. Unfortunately, Republicans in my former hometown of Lubbock did not show the same good sense in two state rep. runoffs. Most disappointing for me was the loss of Republican State Rep. Delwin Jones to Tea Partying novice Charles Perry (who no doubt picked up a lot of votes because of his last name) in the District 83 race. Delwin is 86 and was first elected to the Texas Legislature in 1965, the year I was born. He was a Democrat back then and lost when the Republican tide swept the Panhandle in the early 1970s. He made a comeback in 1989 as a Republican and had held the seat ever since. But during that time, Jones was clearly more interested in representing the best interests of his district rather than doing the bidding the Republican Party in Austin. So when he backed South Plains Democrat Pete Laney for Speaker over Republican Tom Craddick it created a lot of animosity. That animosity carried over after Craddick finally persevered in becoming Speaker only to have Jones throw his support to moderate San Antonio Republican Joe Straus in a successful coup at the beginning of the last legislative session. So it was no surprise that these developments led to having the wingnut faction of the GOP placing a big target on Jone's back for his most recent election. And this time it worked. 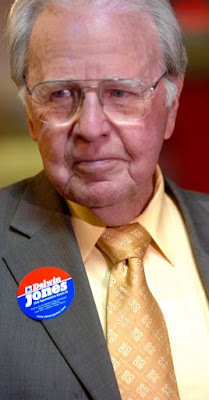 Jones is 86 years old and I'm sure his wife is happy that he will be stepping down even if he is not. My wife's aunt and uncle live down the street from the Jones and have been good friends with them for years. When I worked at the local paper in the late '90s I had several opportunities to meet and interview Delwin and I could not help but like him. He was honest, straightforward and dedicated to his work. I'm sure that Delwin wanted to serve at least one more term so that he could once again chair the redistricting committee. Now the decades of institutional knowledge - especially with regard to redistricting - will be lost. It is a sad turn of events for Lubbock. At the same time, another wingnut Tea Partier won the District 84 seat being given up far-right wingnut Carl Isett. So no change there. When I first moved to Lubbock in 1995, they had two relatively moderate Republican state reps. - Delwin Jones and Robert Duncan. But when then-state Sen. John Montford was tapped to become the chancellor of Texas Tech University, it set off chain reaction of races as Duncan and the then-mayor of Lubbock faced off for the senate seat and a moderate Democrat and wingnut Isett faced off for the District 84 House seat. I remember that the Democrat in that House race had the backing of all the major power players in Lubbock and a big financial advantage - unusual even then for the Republican-dominated city - and I was naively confident that the Democrat would pull it off. But then shortly before the election I saw Delwin and asked him what he thought about the race. I remember that he just shook his head and said the demographics just weren't there for a Democrat to win no matter how many endorsements he piled up. Too many straight-ticket Republican voters, he said. And he was right. And that was too bad for Lubbock because Isett was a particularly awful representative and now they will be getting a double-dose of that kind of representation in the next term.